Delivery Model « Global Market Insights, Inc. Robust advancements in technology have led to a rise in the deployment of IT-based solutions, impelling GPU as a service market. Nowadays, GPUs (graphics processing units) are being predominantly integrated with the CPU (central processing unit) in self-driving cars, artificial intelligence, and high processing power computing, subject to consumer demands for the installation of graphics in their systems. In the coming years, it is expected that the surging automation in vehicles for ADAS, internal infotainment, and other significant applications are likely to contribute toward the growth of GPU as a service industry. It is prudent to mention that several product developers also prefer software-based systems such as CAD and CAM for improving the overall output efficiency and accuracy, which would considerably propel GPU as a service market over the years ahead. Considering the benefits of GPUs, numerous educational institutes have been extending invitations to industry biggies for supercomputer installation. For instance, the Central China Normal University has called upon Inspur to build a petaflop supercomputer, which will help the educational organization host deep learning workloads and traditional HPC applications. The deployment of artificial intelligence in particular, is slated to have a significant impact on GPU as a service industry trends, on account of which numerous companies have been striving to improve their AI-based programs and products for learning institutions. Cray Inc., for instance has collaborated with Intel to enable advancement in machine and deep learning programs. The robustly increasing adoption of AI-based technologies across scientific and industrial disciplines is thus anticipated to play a key role in the growth of GPU as a service market. In recent times, the role of graphics in the automotive domain has increased to quite an appreciable extent, given the massive deployment of electronic content in vehicles. In-car electronics have moved beyond fancy HMI and entertainment displays to passenger protection and safety monitoring systems. Automotive OEMs that implement consumer-centric infotainment and innovative safety features are now attracting more consumers, stimulating the demand for GPUs. 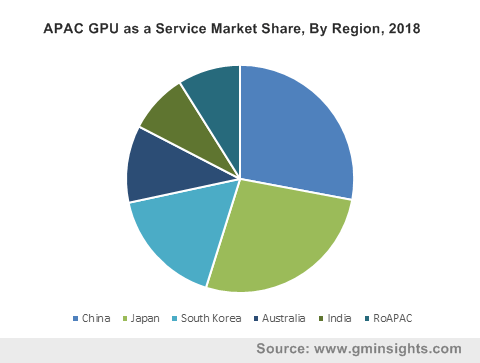 Thus, the surging deployment of 3D graphics and safety applications in automobiles would heavily drive GPU as a service market share in the forthcoming years. Numerous automakers, as on today, have been deploying advanced automotive safety features such as advanced driving assistance systems in vehicles to comply with regulatory norms for occupant and automobile safety. Consumers have also been observed to give more preference for safety features while purchasing the vehicles. It goes without saying that on account of the aforementioned fact, the demand for GPU based built-in computational units that effectively work on safety monitoring would increase by several notches, thereby augmenting the revenue graph of GPU as a service market. In addition, some automakers are looking forward to speed-up real-time response by reducing the time required for parallel algorithm execution in ADAS with the help of parallel processing power of graphical process units (GPU), further boosting this business vertical. In essence, the shifting trends toward the development of autonomous cars is likely to boost GPU as a service industry share in the future. The latest trend proliferating GPU as a service industry is the growing utilization of 3D graphics in the expanding iOS and Android mobile applications. Undeniably, 3D gameplay, UI, and visual captive content are mandatorily being implemented in every mobile operating system. Each one of these implementations demands the deployment of a graphics card for improved functionality, that would commendably impact GPU as a service market share. Effectively, the escalating usage of 3D graphics in mobile devices and the development of fancy UIs incorporating 3D graphics will stimulate GPU as a service market size, forecast to cross a revenue of USD 5 billion by 2024. This entry was posted in Sustainable & Smart Technologies and tagged Animation, CAD, CAM, Compliance, Computer-aided Design, Computer-aided Manufacturing, Delivery Model, Digital Video, GPU as a Service Market, GPU as a Service Market Analysis, GPU as a Service Market Forecast, GPU as a Service Market Growth, GPU as a Service Market Share, GPU as a Service Market Size, GPU as a Service Market Trends, Hybrid, IaaS, Imaging, Managed Services, Modeling, PaaS, Private, Public, SaaS, Security, Simulation, Updates & Maintenance. Firewall as a Service (FWaaS) market landscape to be underlined by strategic tie-ups & collaborations, global industry to record an impressive CAGR of over 25% over 2017-2024. The number of cyber-crimes across the globe is sky-rocketing – a factor that has provided a substantial push to FWaaS market, an integral vertical of the network security landscape. According to recent news reports, roughly 2 billion data records around the globe were stolen or lost by cyber-attacks in the first half of 2017. The increasing complexity and sophistication of these attacks further paint a grim picture of today’s network security landscape, in extension leading to Firewall as a Service (FWaaS) market emerging in rather a gigantic way. FWaaS industry is capitalizing on the back of ever-growing demand for network security and data protection. The maturation of Firewall as a Service (FWaaS) market can also be accredited to the increased utilization of the ever-expanding cloud computing and the regulatory guidelines being prescribed by the Governments around the world to protect critical data and information. Furthermore, the large enterprises are gradually realizing the significance of firewalls and are increasingly adopting the cloud-based firewalls to fortify their data. The prominent cloud firewall service providers and software vendors are collaborating to enhance the customized products and solutions to address the growing market-specific demand. As per a report compiled by Global Market Insight, Inc., Firewall as a Service market size is estimated to grow at a robust CAGR of over 25% from 2017 to 2024. Some of the remarkable benefits of cloud-based firewall services include simplified management, better internal threat protection, comprehensive protection services, reduced cost of training the staff, improved threat perception, and enhanced disaster recovery. The BFSI sector stands to contribute immensely toward firewall as a service industry growth, as the most ferocious cyber-attacks are directed towards financial institutions. The BFSI application, as per the estimates, is contemplating a resilient and sturdy growth of over 22% CAGR from 2017 to 2024. The Governments across the globe are willingly joining hands with the firewall service providers to contain the burden of cyber thefts on the national exchequer, which is carving a profitable roadmap for the Firewall as a Service (FWaaS) market to reap huge benefits in the near future. The recent trend of the increasing collaboration of firewall service providers and pure software vendors is seen to be growing. These proactive and dynamic prospects are vividly underlining the competitive and strategic landscape of firewall as a service industry. To cite an instance, Tata Consultancy Services, a dominant Indian IT service provider, has recently teamed up with US-based security firm Palo Alto Networks to assist enterprises to reliably transfer applications and data to the public cloud infrastructure. The Global Security Operations Centres of TCS will be leveraged to keep a tab on the sophisticated and complex cyber-threats and ward off malicious cyber-attacks trying to inflict organizations. Furthermore, Firewall as a Service (FWaaS) market is striving to be a combative market as the leading players are continuing their efforts to integrate with cloud companies to cater to a wider range of customers. As enterprises are willing to invest in upgrading and refining the cloud security and automation of firewalls, the firewall management software market will obtain a much-required boost. If the recent news reports are to be believed, the hackers are making a concerted effort to reverse-engineer devices and apps. A simple misconfiguration would expose a serious vulnerability in the network of any enterprise. The loopholes include downtime, irregular optimization of firewalls, and infringement of policy guidelines. In response, the firewall management softwares like the Next Generation Firewall (NGFW) is set to make a rather pronounced impact in the firewall as a service market, courtesy its multifunctional security potential. Speaking of the regional distribution of firewall as a Service market, North America has the largest market size and is presumed to grow at a higher rate owing to its network security infrastructure, heightened awareness and the speedy adoption of latest cutting-edge cybersecurity technology. The Asia Pacific FWaaS market, which has the highest number of SME’s, is expected to thrive in the coming few years as the increased awareness, security infrastructure and technology adoption acquire significance. 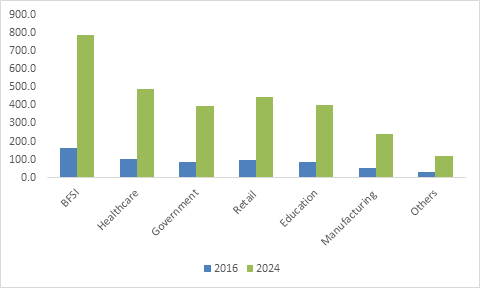 In terms of global commercialization potential, Global Market Insights, Inc. estimates the firewall as a service industry to hit a revenue of USD 2.5 billion by 2024. This entry was posted in Sustainable & Smart Technologies and tagged Auditing, Automation, Backup, Cloud Security, Compliance, Connectivity Management, Delivery Model, Firewall as a Service Market, Firewall as a Service Market Growth, Firewall as a Service Market Share, Firewall as a Service Market Size, Firewall as a Service Market Trends, Firewalls, FWaaS Market, Hybrid, IaaS, Management Software, Management Tools, Next-generation Firewall, PaaS, Private, Proxy Servers, Public, Recovery, SaaS, Service Model, Stateful Inspection Firewall, Unified Threat Management.